On behalf of the Superintendent and Search Committee of the American School Foundation of Monterrey, in Monterrey, Mexico, we are pleased to announce that after a worldwide search which produced a large number of highly qualified candidates, Mr. Sheldon Guenther has been appointed as the new Middle School / High School Head of Campus and HS Principal, beginning in August 2018. Mr. Guenther is currently Head of Secondary School at St. Andrew’s Scots School in Buenos Aires, Argentina. Prior to his current position he served as Secondary School Principal at Colegio Panamericano in Bucaramanga, Colombia. He has also held administrative and teaching positions in Venezuela, China, Tanzania and in his home country of Canada. Mr. Guenther earned his Bachelor of Education Degree from the University of Saskatchewan, a Certificate of International Leadership from the PTC, and a Master’s Degree in Education Technology and Design from the University of Saskatchewan, in Canada. Superintendent Dr. Michael Adams, the Search Committee and Search Associates would like to thank all candidates who expressed interest in the Middle School / High School Head of Campus and HS Principal search, and to everyone who assisted and supported the search process. 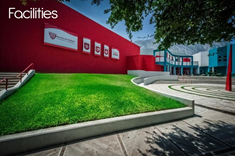 American School Foundation of Monterrey (ASFM) is a private, secular, non-profit, Nursery through 12th grade, college-preparatory, U.S.-accredited, co-educational institution, which offers both a Mexican and U.S. High School Diploma that serves the local and international population. ASFM is a community of learners, engaged in the search for open minds, caring hearts, global leadership, and sharing of knowledge and experience among its members. This community, composed of students, alumni, parents, teachers, support service personnel and administrators, recognizes and is enriched by the fact that each member brings their own personal experiences, national heritage, language and family customs and values to our institution. Each member is a unique individual, possessing a wealth of thoughts and feelings that are most valuable when shared with others. Monterrey is one of the three most important cities in Mexico. Surrounded by the beautiful Sierra Madre mountains in the Northeastern part of the country, the city has an altitude of 537m above sea level. Its population reaches more than 3.5 million people. The city is full of tradition, culture, and progress. Monterrey has nine months of warm weather and three months of colder temperatures. Being a semi-desert region, rainfall is sporadic throughout the year. The warm weather starts in March and continues until the end of October with temperatures ranging from 80° to 100°F. During January and February, some cold spells usually occur. Temperatures can go below freezing; however, snow is rare. Though primarily a city of industry, Monterrey offers its share of museums and restaurants, with many interesting places to visit nearby. In addition, Monterrey has many things to do for the adventurous: rock climbing, hiking, mountain biking and more. We believe in open minds, caring hearts and global leadership as essentials for a healthy and successful life. 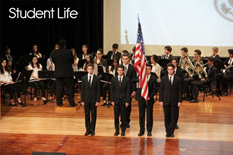 The American School Foundation of Monterrey (ASFM) fosters open minds, caring hearts, and global leadership within the entire school community. ASFM serves a diverse population and prepares all students through an innovative, inclusive, and intensive program focused on engaging and enabling students to achieve their individual potential in citizenship, academics, athletics, and the arts. ASFM offers an educational program for grades Nursery through 12th grade. The Preschool is composed of Nursery and Pre-Kinder. The Elementary School includes Kinder-Grade 5. The Middle School includes grades 6-8. The High School includes Grades 9-12. 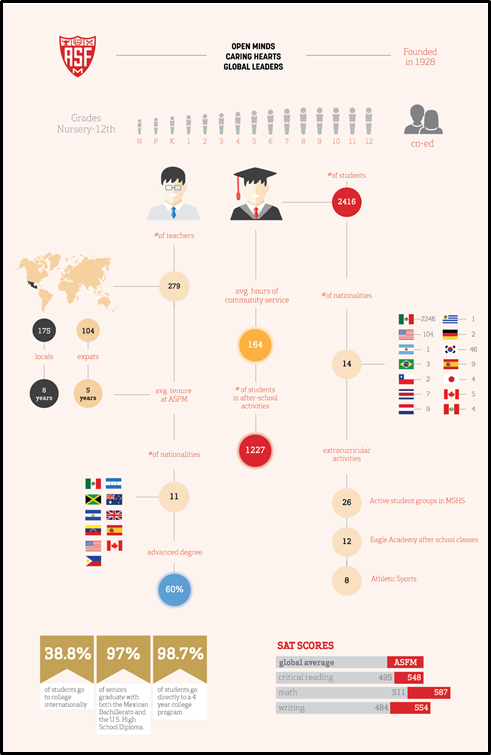 The Mexican Bachillerato program is a six semester program that corresponds to Grades 10-12. It is our purpose to provide each student with a learning environment that is both challenging and rewarding; one that encourages discovery and the development of special talents, abilities, and interests in academics, athletics, citizenship, and the arts; one in which the teacher serves as a facilitator and catalyst to learning as well as a source of knowledge. It is our goal that in this environment each student will learn to appreciate a diversity of opinions and ideas and will become a critical and creative thinker and communicator as well as a self-disciplined and positive member of the community. The curriculum shall be modeled after best international practices. The curriculum in each subject area should reflect a coherent, orderly progression through the grades. The curriculum should be continually reviewed by the professional staff to ensure that it meets the needs of our students and to constantly upgrade and improve the course of study. Curriculum development is the responsibility of the entire academic staff, but the leadership and coordination of the development process is the special task of the Superintendent in conjunction with his or her staff. ASFM offers a demanding college preparatory program modeled after current international educational trends and methodologies that fosters open minds, caring hearts, and global leadership, serves a diverse population and prepares all students through an innovative, inclusive, and intensive program focused on engaging and enabling students to achieve their individual potential in citizenship, academics, athletics, and the arts. ASFM is licensed to operate as a private school in Nuevo Leon, Mexico, and is subject to the regulations of the Secretary of Education of Nuevo Leon and local and federal legislation that are applicable to private schools. The ASFM Board of Directors determines and reviews policy, hires and evaluates the Superintendent and then delegates executive, supervisory, academic, and instructional authority to the Superintendent, and through the Superintendent to the employees. The Board of Directors is composed of no more than fifteen (15) Members appointed by the Associate Assembly. The MSHS Head of Campus and HS Principal shall direct the day-to-day operation of the MSHS in conformity with official school policy and administrative regulations issued by the Superintendent. Establish and maintain educational standards and practices corresponding to the Vision, Mission, Identity and Philosophy of the School. Supervise teaching personnel and administrative staff assigned to the department. Develop and monitor the budget for the MSHS section. Manage and lead the recruiting and hiring of all MSHS staff. Complete other related duties assigned by the Superintendent. Please click on the links above for more photos and/or visit our website to learn more about ASFM. Salary and benefits are competitive and will be dependent upon the qualifications and experience of the successful candidate. ASFM has appointed Search Associates as consultants with Ralph Jahr as the lead consultant. The deadline for applications is August 30, 2017. Candidates are asked to submit a letter of interest and the requested materials listed below as early as possible as the School reserves the right to close the selection process prior to the deadline if the right candidate is found. Applications and supporting materials for selected candidates will be forwarded to the Superintendent of ASFM on a rolling basis and Skype interviews might be arranged at any time after applications have been submitted. From one to three finalist candidates will be selected by September 30, 2017 and site visits of finalists might be arranged in mid-October 2017. The new MS/HS Head of Campus / HS Principal will be identified by 30 October 2017. A letter of application, explaining your strengths as a candidate and why you are interested in becoming the MS/HS Head of Campus and HS Principal at ASFM. A one-page list of references with current, accurate email addresses and phone numbers of current and former supervisors, Board members, and/or other supervisors who have knowledge of your work.